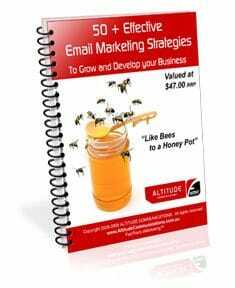 In this document, we share with you 50+ fresh eMarketing ideas and tactics to help you to attract new clients and grow a profitable business without spending a fortune. Simply complete your details below, and your FREE 50+ Marketing Tips will be sent to your email address immediately... plus we'll also give you a FREE subscription to My Marketing Mentor eNewsletter. Designed to help you to boost your marketing results whilst still growing and developing your business, our My Marketing Mentor eNewsletter is like having an ideas coach at your fingertips. We respect your privacy: Your information is safe and secure. We do not sell or rent our electronic mailing list to anyone at any time for any reason. You may remove yourself from the list at any time you choose by clicking on the unsubscribe link.